Wow, what a roomy 43 footer! It seems more like a 46 or 48 footer. The spaces are ample and well designed, featuring a large owners cabin aft, with comfortable bed, plenty of changing and storage spaces, with your own bathroom and separate shower. The main saloon is modern and comfortable with recliner lounges. Step down to the Dinette and Galley with plenty of modern appliances and beautifully designed dinette. Walk through to the V berth area with another large double bed with its own toilet and shower. Up on the aft deck is a great entertainment space for relaxing with all your friends. Down the easy stairs to the lower deck is a large storage bin and easy walk around and get off area. The Cockpit is large and comfortable with plenty of comfortable seating. 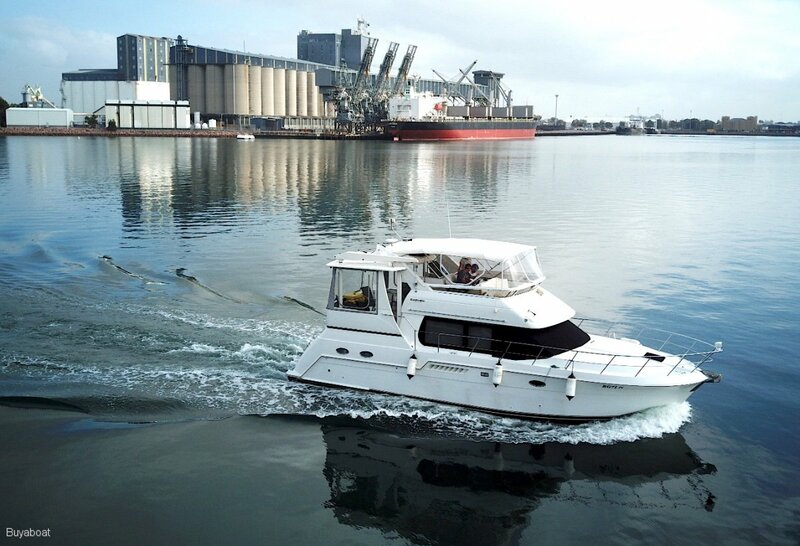 A great boat for fast, comfortable and economical trips up and down the coast. Twin 6BTA 5.9 L Turbo diesel engines. Water intakes have just been fully serviced. 3 x 400 L aluminium tanks. Great modern galley, with Princess Electric oven with 3 burners, grill and oven, Sharp microwave, heaps of cupboard spaces, Corean bench space and sink, with hot and cold water. Large 230 L upright fridge with freezer above. V berth large double, dinette folds down double and large aft cabin with great island queen sized bed. 2 electric Vacuum toilets with holding tanks. 32 " Samsung Tv and 20 " TEAC TV, Fusion stereo system throughout boat with blue tooth connect. Inflatable tender in good condition. New flybridge clears, cockpit clears, window shade and dingy cover. Muir electric anchor winch, heaps of chain, fenders and lines. 8 life jackets, EPIRB, V sheet, 3 fire extinguishers, flares. 2 x 120AH engine batteries, 2 x house 120AH batteries, 1 generator 120AH battery. 60A battery charger, shore power rigged, remote spot light, 12 V LED lighting. Genset runs entire boat when not on shore power. E+G Autopilot ( Never used) Raymarine Touch Screen As New Chart Plotter, Raymarine and Lowrance depth sounder, ICOM VHF radio. Boat mooring hook, boat swim ladder, gas BBQ, davit crane.